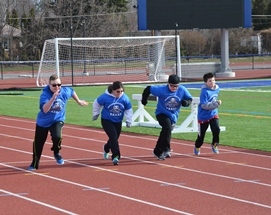 AMHERST, N.Y. – Daemen College’s Center for Allied and Unified Sport and Exercise (CAUSE), which offers recreational and competitive athletic opportunities for persons with disabilities, has been awarded a $25,000 grant from The Children’s Guild Foundation. The grant will support a range of CAUSE programs that provide to persons with disabilities opportunities that promote exercise, sportsmanship, and skills development. The center’s activities are also designed to foster social interactions by pairing participants with Daemen students, student-athletes, faculty, staff, and coaches. CAUSE, which was co-founded by Daemen Athletics in close collaboration with the college’s Social Work and Special Education Departments, offers recreational and caregiver support to the disabled community in Western New York. Since the center was established in 2017, more than 750 area residents have participated in free weekly sessions held in Daemen’s Academic and Wellness Center (AWC), located across the street from the college’s main campus. In addition to supporting weekly programming, The Children’s Guild Foundation grant will provide funds for CAUSE activities that give primary caregivers the chance to relax and enjoy time to themselves, socialize with other caregivers, or exercise in the state-of-the-art fitness center in the AWC. The Children’s Guild Foundation provides financial and advocacy support to nonprofit organizations providing services and programs in the areas of health care, education, therapeutic recreation, and research benefiting differently-abled children and young adults. For more information on CAUSE, visit daemen.edu/CAUSE.